It's so nice to feel the hot sun again. 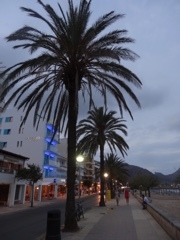 Here in Pollensa in Majorca my young friend and I have rented a villa for the week. It's a bit rustic but comfortable. 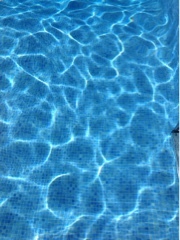 The pool is very cold when first ventured into but that's probably because the sun is so hot. We bought a couple of Li-Los at the cheap and cheerful Chinese store nearby which took ages to blow up by mouth ( more MYF's breath than mine) and one of them didn't last more than a day anyway. So we bought another one today - this time with a foot pump. Yesterday evening we drove to an amazing edifice a short way from Palma to have dinner while watching a lavish show called Kaleidoscope. The entrance was pretty impressive and as we'd pre-booked 'platinum' seats we were treated like VIP's on the way to the vast auditorium. The meal was fantastic and our seats near the stage couldn't have been better. There must have been about two hundred diners there. 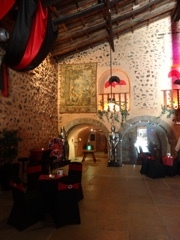 The dinner-theatre is called Son Amar. We arrived about 7.30 for cocktails and left when the show ended just before midnight. 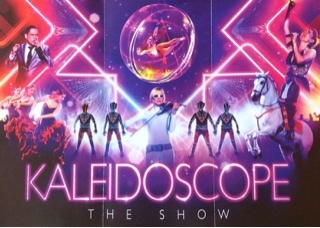 There was a bit of everything - incredible dancers, magic, trapeze artists, a virtuoso violinist, a magnificent dancing horse, plus so much more. The laser effects were quite something as was the contortionist writhing around in a gigantic bubble just above the stage . What impressed me most was a dancing 'battle' between flamenco dancers and Irish syncronised dancers. Each trying to outdo each other by dancing faster and faster. It reminded me of the fight scene in West Side Story between the Jets and the Sharks. 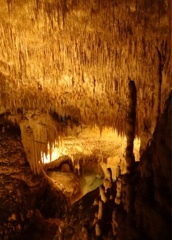 We had pre-booked a visit to the Caves of Drach on the east coast for Monday afternoon. 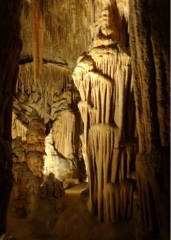 Also called the Caves of the Dragon. 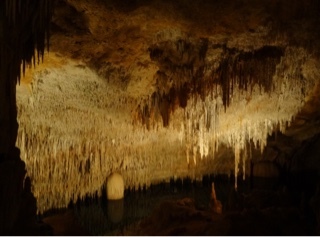 We didn't actually see any dragons but that didn't matter because the vast cavern was absolutely spectacular. They were known in the Middle Ages and explored in 1880. Dramatically lit we were transported to a magical watery underworld. 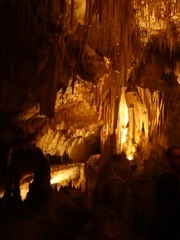 As soon as we entered the caves everywhere we looked there were stalactites and stalagmites of every size and shape - and all dramatically lit. Here are just a few scenes with names such as The Enchanted City and The Fairies Theatre. 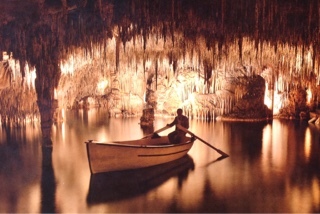 After nearly an hour spent in the caves where we followed a winding path up and down and round and about we arrived at the lake where soon an illuminated rowing boat appeared out of the darkness containing a classical quartet (two violins, a cello and a harmonium) playing a ten minute concert. Quite enchanting. Then after the concert we got into another boat and were rowed a short distance to a point where we began our ascent. 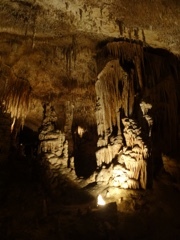 (When I last visited the caves 15 or so years ago we ended the tour on a boat which travelled all the way to the exit via an incredible tunnel lit from wall to ceiling by millions of gloworms, but they seem to have abandoned that these days. Probably too many tourists. 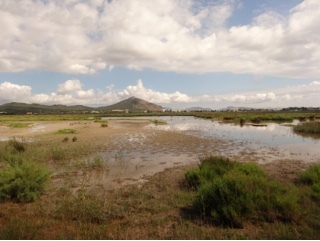 Yesterday morning - up early - we took a trip to S'Albufera de Mallorca Natural Park hoping to see lots of birds in this the largest wetland area in the Balearic Islands. Wandering through the woodland my young friend (who is a keen amateur birdwatcher) was hoping to see one of the bee-eaters but none were around that day. 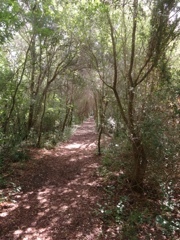 This was the view from one of the hides - out towards the wet grassland and marsh. 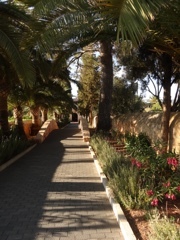 Our villa is quite near Port de Polllenca where we seem to have spent most of our time having dinner there. 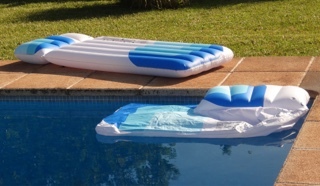 But today is really hot so we are spending most of the day lazing by the pool. 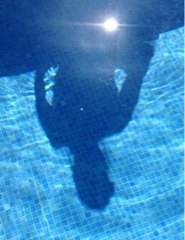 And here is a rare glimpse of my young friend sitting on the edge of the pool and reflected in the water.